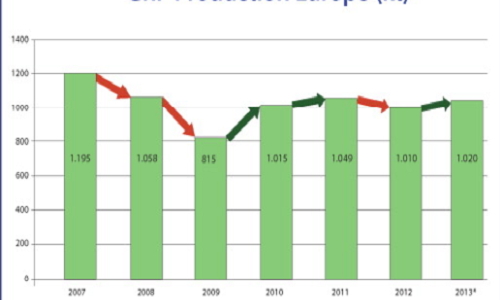 The European plastics production continues its positive trend (+1.5%) in 2014 as a continuation of its recovery since 2013. This positive growth is expected to continue (+1%) in 2015, says PlasticsEurope. “The plastics industry is a key contributor to the reindustrialization of Europe due to its knock-on effect on other key areas of the economy.&nbsp;In Italy,and for every job created in the plastics sector, almost 3 additional jobs are created in the wider economy,” said Karl- H. Foerster, Executive Director, PlasticsEurope. “Access to competitive energy and raw materials, support for innovation and training, investment in innovation as well as a consistent and complementary regulation will create the right conditions for our industry to continue to make a meaningful contribution to European economy and society at large”, expressed Mr Foerster. PlasticsEurope presented its most recent economic data for the plastics industry at a round table on 22 January in Brussels, showing the overall trends for 2014 and 2015 of the European plastics industry.